Beckwood, St. Louis, MO, has expanded its Triform product line with the addition of a 10,000-PSI deep-draw sheet-hydroforming press. It features a 20-in.-dia. maximum blank size, 10-in. draw-depth capacity and an integrated tool-change system for fast changeovers. The new Triform Model 20-10-10BD offers cycle times less than 30 sec., while allowing fabricators to form large parts within a relatively small footprint without altering their facility’s foundation. “Hydroforming presses are quickly becoming a go-to solution for complex forming challenges,” says Triform technical sales manager Bob Blood. The 20-10-10BD benefits from all of the same characteristics found in other Triform deep-draw presses—precision diaphragm pressure and punch-position control, combined with built-in recipe handling capability. 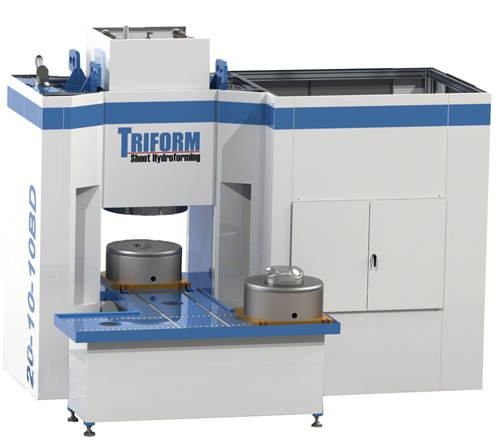 And, for fast, cost-efficient new-part development, according to company officials, the 20-10-10BD features Triform’s In-Sight feature that allows the operator to pause and open the press at any point in the forming cycle to perform a visual inspection.